A magnitude 6.7 earthquake occurred on Saturday, July 18, 2010 at 9:56 pm AKDT (July 18, 05:56 am UTC) in the Fox Islands region of Alaska (larger red star on the above map). It was located 60 km (38 miles) WSW of Nikolski and 248 km (155 miles) WSW of Dutch Harbor. It was preceded by a mangitude 4 foreshock on July 17 at 14:44 UTC. AEIC located nearly 3,200 aftershocks through end of July, including about 60 aftershocks with magnitudes 4.0 or greater. The largest aftershock of magnitude 6.0 occurred on July 18 at 19:48. M6.7 earthquake was reported felt in Unalaska (intensity IV, light) and Dutch Harbor (intensity II, weak). This is the largest event to occur in the region since the M6.5 earthquake on October 13, 2009 (yellow star). Magnitude 6.4 earthquakes occurred in the region on May 10, 2006 and December 26, 2007 (yellow stars). The 2006, 2007 and 2009 earthquakes occurred on convergent boundary between the subducting Pacific and overriding North American crustal plates. This region, where Pacific plate is being forced under the North American plate, is one of the world's most active seismic zones. 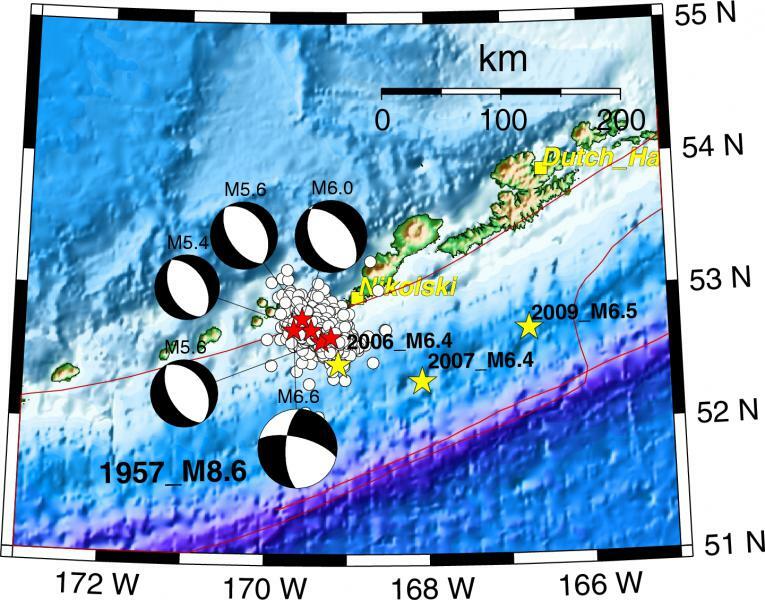 In 1957, magnitude 8.6 Andreanof Islands earthquake ruptured a ~600 km-long portion of the plate boundary in the central Aleutian Islands. The current sequence of earthquakes is located above the ruptured portion of the megathrust. The earthquake depths are shallow, indicating that they occurred in the crust of the North American plate. Based on the waveform modelling, the mainshock and largest aftershocks are characterized by normal faulting on a NNW-SSE oriented fault plane.